Before I removed the warp from my Pine Tree Table Runner, I wanted to weave a few mug rug size samples of an idea I've had on my mind. Do you remember my first warp painted project? I took a break from my summer & winter explorations for that, and the entire time I was weaving I was wondering about combining the two. These little samples did that. ....wasn't actually painted. 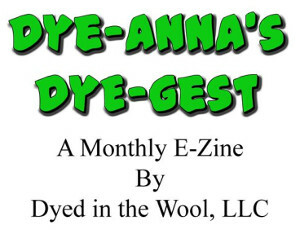 It was dip-dyed last summer when I was first working with Procion MX dyes. They were part of my experiments with PMX exhaust, and they suited these samples. 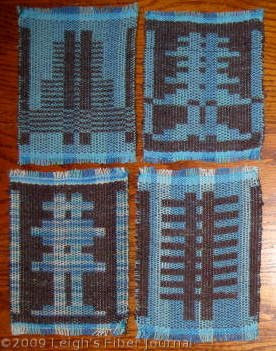 I used a solid turquoise tabby weft for the first three, and then switched to the dip-dyed yarn for a tabby weft for the last one (bottom left). I learned several things from these. Firstly I was reminded how different S&W can look with a heavier, softer pattern weft. I have tended to use pattern wefts just a little heavier than the tabby. 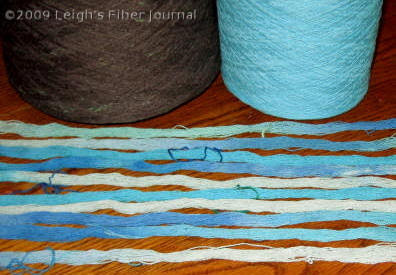 This one was a soft, 3/2 cotton which covered the warp (8/2 cotton at 16 epi.). This brought definition to the pine trees. Good to remember for weaving picture patterns like this. Secondly, I learned that as much fun as it was to weave those pine trees, shapes are not what I enjoy about S&W. These can be accomplished in other ways; in fact I've moved double weave closer to the top of my "to-do" list. What I have loved about S&W is what a weaver can do with color. Remember these (click here) dishtowels? They held hours of fascination for me. Not because they are geometric shapes (modern is not my style of art), but because of the blending of the colors. Those are really cool. I really like the turquoise threads. It makes the mug rugs cheerful in a cool (in terms of color) way. Cool trees!! I'm always intrigued by the different patterns a loom can produce....so I'm loving those trees! (Plus, I love trees in general). It's surprising to me that so much of the color blends together. Looking at that warp, I would have expected it all to seem brighter and more varied, or something. I definitely have a lot to learn!!! Thank you! Actually, I was surprised at the way the colors turned out myself. I too was thinking they colors would be more predominant. I had an idea in mind that would have capitalized on that, but now I have to re-think. Sampling comes to the rescue in more ways than one. And so your journey continues.......And I am very much enjoying following it. Thank you for sharing.